Rhododendron plants are small to medium ornamental shrubs, bearing blooms in the late spring and summer. They become rounded with age, spreading to a width of up to 6 feet and reach a height of 10 feet when fully mature. They enjoy a partial to full shaded area with a well-drained acidic soil. 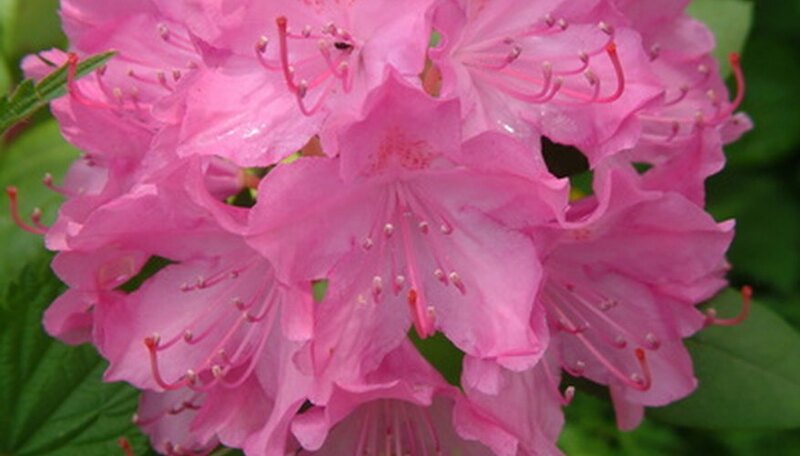 Rhododendrons prefer a soil acidic pH of 6.5 or higher. Root rot is common with this shrub, as the root ball does not tolerate soggy soil. Transplanting to a new, more soil adequate location is possible, although moving the large root system can be difficult. The rhododendron does tolerate transplanting and it is usually a success. Dig a trench 12 to 18 inches deep around the root ball of the shrub. A rhododendron of 5 feet in height will have a root ball of 3 feet in diameter. Undercut around the root ball with a pointed shade shovel. Push the shovel under the root ball, severing the root system from the soil. Lift the shrub from its existing location, tilting it onto a piece of wood or a tarp to ease transport of it. The root system will be up to 3 feet in diameter and up to 2 feet in depth. Dig a hole three times the diameter of the root ball and near the depth. Place the shrub in the new location, leaving 2 to 3 inches of the root ball above the surface grade of the area. Backfill the hole with soil, mounding the soil around the top of the exposed root ball. Gradually slope the soil away from the trunk of the shrub. This slope will prevent over-watering and future root rot. Water generously. Apply a layer of mulch 2 inches think around the shrub. Do not allow the mulch to touch the base of the rhododendron. Maintain a slightly moist soil for the first year after transplanting to prevent root rot and promote growth. Fertilize with a shrub fertilizer, following the package directions, twice annually. A steel cable and a tractor can be used to remove the shrub instead of a shovel and hard labor.